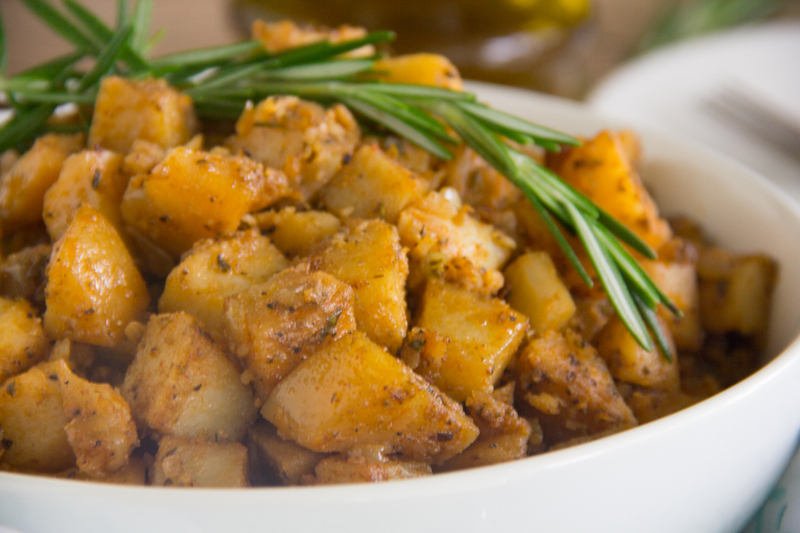 Matt’s Big Breakfast – Oven roasted potatoes combined with caramelized onions and savory rosemary makes for the perfect breakfast or brunch treat. Last month, my immediate family embarked upon our very first family vacation EVER!! My hubby, Mommy, Daddy, and Auntee Gail and I all visited my brother and cousins in the Phoenix, AZ area. We absolutely loved the desert!! I’ll take 110 degree dry heat over 80 degree Michigan humidity any day!! One of the first places that we enjoyed breakfast was at Matt’s Big Breakfast!! We loved how everything served was humanely raised, grain fed and organic. Hubby and I enjoyed the The Chop and Chick with the delicious Rosemary Home Fries!! Matt’s Big Breakfast Rosemary Home Fries were definitely on point. They were full of flavor and simply irresistible. I kept dreaming about them so much that I just had to recreate them. I love having potatoes for breakfast which I guess is attributed to that country girl spirit way deep down inside. 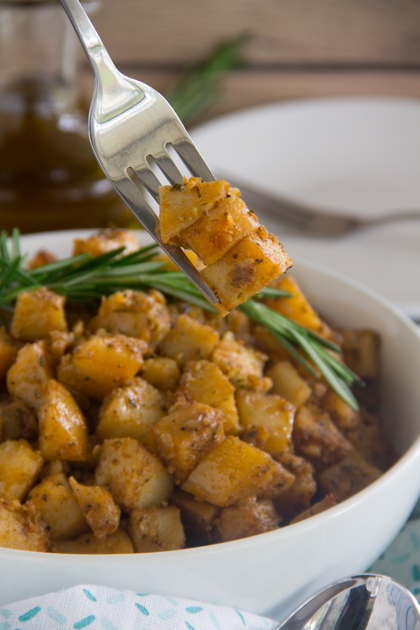 🙂 Matt’s Big Breakfast Rosemary Home Fries were prepared with caramelized onions and of course, savory rosemary. They were truly one of a kind and I hope you’ll give them a try!! It was such a joyous time to be able to really enjoy the family while on vacation and Matt’s Big Breakfast was certainly a big highlight. We all know that it’s important to create and foster those great relationships within our families. We all have our own personalities and individuality, right?!?! If we examine ourselves, are we really getting to know them and trying to discover their needs as an individual? Or are we trying to figure out what’s in it for me???? It’s not always easy but it’s definitely necessary to put others needs before our own if we desire to truly grow our relationships within our families. Ultimately, true love is all about sacrifice, right??? I love the way the New Living Translation says that, it doesn’t demand it’s own way. – 1 Corinthians 13:5 (NLT). 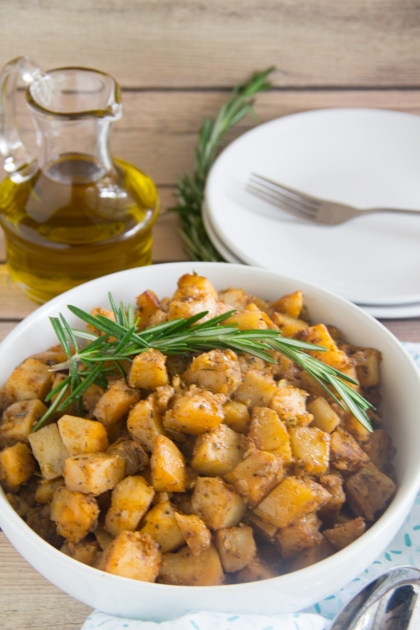 Oven roasted potatoes combined with caramelized onions and savory rosemary makes for the perfect breakfast or brunch treat. Combine the oil , rosemary , garlic, salt and pepper in a blender and blend for a couple minutes. Allow the oil to sit for at least 30 minutes or overnight and strain into a small bowl. You should be left with about 1/3 cup of oil. In a 13 x 9 roasting pan, combine the remaining ingredients with about 1/3 cup of the oil. Roast stirring occasionally for 45 minutes or until potatoes are tender. Say Grace and enjoy!! Thanks Chris!!! They are perfect!! I had home fries the first time I visited the states and i have been hooked every since. I love the addition of rosemary here too. I know, right?!?!? Rosemary is everything!! I love that there’s some spice in this, they sound great! A delicious combination of lovely flavours, made to perfection. 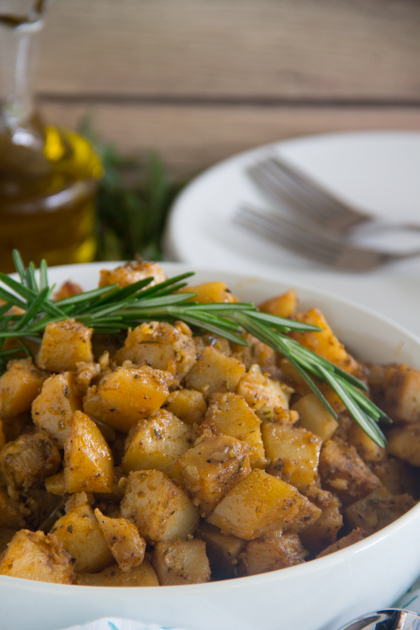 The rosemary is such a lovely compliment to potato, and with the mix of spices, they must smell amazing. They certainly do, Helen!! Such a delicious treat!! If those potatoes taste half as good as they look, then I’m in for a real treat, because, like you, I love home fried potatoes with my breakfast, anytime I have the chance to make them. Thanks for another great recipe. Those potatoes will go great alongside a steak or some grilled lamb chops too, at dinner time.